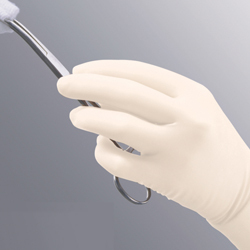 The Sensicare Aloe surgical glove is Medline's answer to its competitor's polyisoprene surgical gloves. Medline's synthetic polyisoprene glove is manufactured using new formers that shape the gloves to provide a seemless fit. Sensicare Aloe surgical gloves are 100% latex-free and is ideal for anyone who is sensitive to latex proteins. Like it medical exam glove Aloetouch line, the Sensicare Aloe surgical glove has an inner coating of pure freeze-dried aloe vera. When the gloves are donned, the natural heat from the hands activate the aloe vera which moistures the skin until the gloves are taken off.